Choose your own word, phrase, logo or artwork to be engraved on natural river rocks. Minimum quantity purchase is 25 stones of the same design. Quantity discounts available at orders of 50 ($3.25/each), 100 ($2.75/each), 500 ($2.25/each) and 1000+ ($1.95/each) - discounts will automatically calculate in cart. A unique and creative, gift, favor, or motivational tool. STONE SIZE & COLOR: Engraved River Stones measure approx. 2" - 3 1/4". Natural stones vary in size and shape. Colors range from browns, tans, dark reddish brown and greys and stones will come in a mix of colors. Engraved stones are polished for a smooth finish. FONT: There are a wide variety of fonts available to be engraved. Below we have illustrated our top 10 most common fonts. Please choose a font in the text box below. 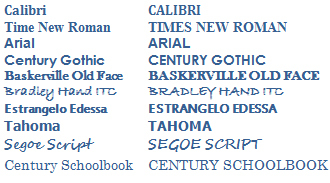 Don't see your favorite font? No problem - feel free to choose a font not on the list. PRODUCTION TIME: Typically orders take approx. 3 - 5 weeks for production and delivery. ** If you have a specific need-by date, let us know and we will do our best to accommodate your needs. **Orders over 5000 stones take approx. 6 - 8 weeks for production. You will not receive a mock-up of the order UNLESS you specifically request one. Please write a note in the comments box at checkout if you require a proof - we would be happy to provide a simple PDF layout of the stone.